The Peachtree Commercial Real State project had many different elements. The client was rebranding two separate companies and wanted new websites for each company. They loved the design we came up with so much, that they decided to use it for both new sites. Once the first site was built, we cloned it to the 2nd site and modified the content and colors to align with the new company. 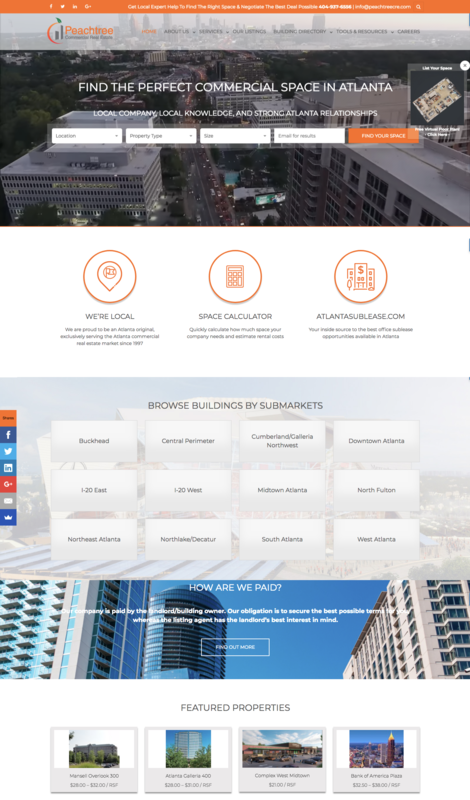 Not only was this project large and complex, but we had to pay special attention to use the exact same URL taxonomy from the old sites to the new, so as not to disrupt a significant SEO history of over 400 previously indexed property listings pages. After reviewing several listings plugins, we decided that none of them would satisfy the scope, so we built one ourselves. These sites have too many great features to list, so feel free to see for yourself. Chris and CMH Technology did a great job creating our site based on how we envisioned our website to look and the functionality we needed. They were able to effectively represent our image and our clients and friends think our website looks fantastic. Chris was easy to work with and offered suggestions for additions to the site throughout the process. Overall the pricing was very competitive. We highly recommend CMH Technology’s web design services.